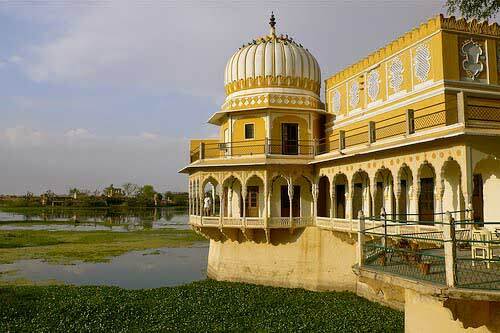 The Phool Mahal Palace was constructed in the year 1870 by the king Kishangarh Maharaja. It is located in the centre of the city and has now been converted into a boutique hotel for tourists. This hotel is laden with all the modern day facilities and amenities. The hotel rooms are decorated with beautiful paintings and ancient royal and British furniture. The guests can enjoy delicious Indian, Chinese and western cuisines here. The tourists can avail various facilities like library, jogging tracks, laundry services and so on at this boutique hotel. An artifical lake and scenic lawn increases Phool Mahal Palace beauty manifolds. By Road: Phool Mahal Palace is located at 85 km east of Kishangarh city and only 15 minutes drive from Kishangarh/Jaipur Highway. One can easily reach here by hiring taxi from Kishangarh. By Rail: Phool Mahal Palace is well connected through nearest Ajmer Railway station (	36 km) to major cities railway stations like Delhi, Agra, Mumbai, Chennai, Ajmer, Pali, Jaipur, Ahmedabad. By Air: Phool Mahal Palace can be reach through nearest Jaipur Airport (109 Km) which is well connected with regular domestic flights to Delhi, Mumbai.